This is the second crash post we’re doing on the blog back to back but the reasons are certain, first our dream car was crashed followed by a guy who just thought out a better way to preserve the Ferrari he had crashed beyond repair. But the fact is, if a sports car is red than it must be a Ferrari for an ordinary person and especially if that person is a Pakistani. Even Lamborghini is lesser known in Pakistan – two-fact, Ferrari is known by every person mind you. Charly Molinelli of Molinelli Designs took it upon himself to turn Ferrari scrap metal into something that will evoke the same feelings as an actual Maranello marvel. We’re talking about a coffe table made of what looks to be a crashed Ferrari 360 Modena, judging from the color and what’s left of the bumper. 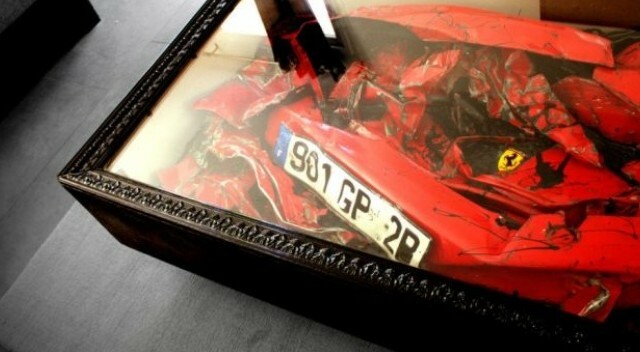 Check out the framed wreckage of the Ferrari, including its French license plate, in the gallery below.